Customer requested shelving that would take up an entire office wall so books, trophies, & other memorabilia could be stored & displayed. 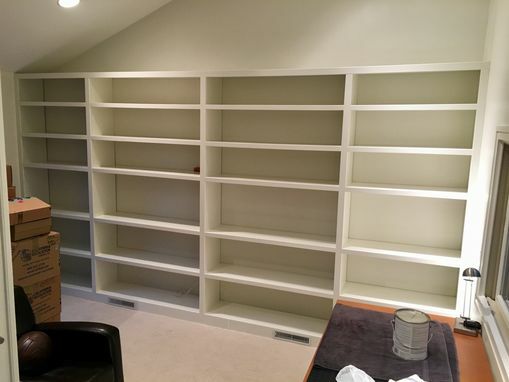 Four shelving units were constructed off-site, two-13" deep x 36" wide x 8' tall units & two-13" x 48" x 8' units. 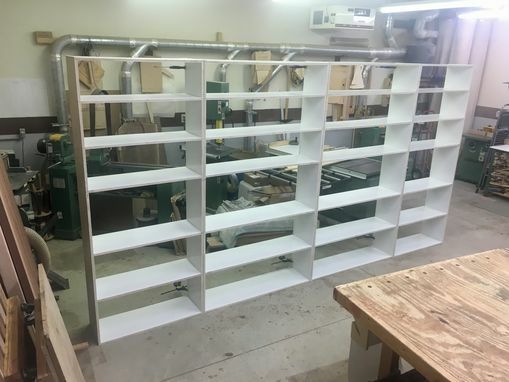 Shelves were assembled into grooves cut into the sides and locked in place with glue & screws. Each unit was clamped with right angle blocks to ensure units were square. All moldings and trim were cut off-site; shelving units, moldings, & trim were primed and received 3 coats of Benjamin Moore "Dove Grey" semi-gloss paint. Also, a 3-1/2" tall x 13' w x 14' base made of 2 x4 construction lumber was constructed for the Shelving. The Shelving units with the moldings, trim, & base were packaged & shipped to the customer's house for installation. Initial installation required removal of the back & side base moldings, the back wall already was painted with the Benjamin Moore "Dove Grey" paint. A 13" wide strip of existing carpet then had to be removed so the base could sit flat & level with the subfloor. Once leveled, the base was secured to the subfloor & back wall. Existing floor air vents were redirected through openings cut on-site to allow proper air circulation. All four Shelving units were set in place & secured to each other & the base. 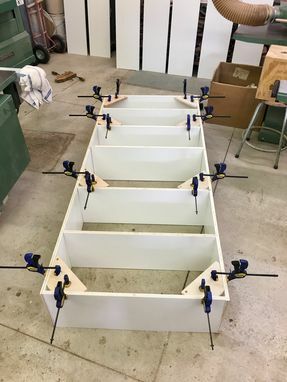 Additionally, to prevent the Shelving units from toppling over, "L" brackets painted white were installed on the very top of each unit, 2 per unit, and screwed to studs in the back wall. All horizontal & vertical trim was then installed, followed by the moldings on the front of each shelf. An LED rope lighting system selected by the customer was then installed behind the moldings; a remote allows for several color displays as well as different lighting effects.